The memory of a righteous person is a blessing. At a family therapy session, one family member said something totally uncalled for, provocative, and insulting to another person. The remark was extremely irritating to me, even as an observer, and I anticipated an explosive outburst of outrage from the recipient. To my great surprise, the latter remained quiet and merely gestured to indicate that he was dismissing the comment as being unworthy of a response. After the session, I complimented the man on his self-restraint. He explained, “A friend of mine once had a very angry outburst. During his rage he suffered a stroke from which he never regained consciousness. The verse cited above may be explained in the same way. People should behave in a way that they would wish others to remember them, for that can indeed be a blessing. behave as though this day is the one by which I shall be remembered. There’s more than a little anger flowing around on the Internet. Anyone with the ability to create a website or a blog potentially has access to a vast audience (though in reality, how many people really read all these messages), and whatever ax they have to grind, the website owner or blog writer freely grinds. I can’t exempt myself from such company since, given a good enough reason, I can go off half-cocked, just like the next guy. But as we can see from the story told by Rabbi Twerski, if we allow hurt and anger to rule our lives, hostile words may be the last thing anyone remembers about us. Is that the sort of legacy you want to leave behind? Many years ago, a psychologist friend of mine told me that anger is a “secondary emotion.” People don’t feel anger without some other emotion happening first. Usually it’s some sort of hurt or anxiety, like when you accidentally hit your finger with a hammer. First you feel pain, then you get mad at the hammer. But there’s another kind of pain that people can suffer from, often for years or even decades. It’s the pain of unresolved fear or anxiety or loss. When we see a person fly off into a rage, all we are aware of is the rage, the unpleasantness of hearing such angry words and seeing someone screaming red-faced at us. We typically aren’t able to see behind the face at the sad, lost, and frightened person who is hiding beneath the anger and hostility. Believe me, that “rager” isn’t half as angry at you or me as he or she is at themselves. Have you ever wondered why Jesus said this? Why love your neighbor as yourself? What if you don’t even like yourself? What if you detest and loathe the person you are? How could those feelings in any way translate into loving another person and how in the world could Jesus make “love” a command? Emotionally, some people are just barely able to get by from day-to-day. Love would be an enormous stretch for them. If you had a greater amount of self-respect, what is one special thing you would do differently today? What can you do today that would be an expression of greater respect for others? Look at what Rabbi Pliskin is saying. He’s associating self-respect with respect for other people. I’ve said in the past that Jesus directly connects the commandment to love God with the mitzvot of loving your neighbor. You cannot say you love your neighbor unless you love God and you cannot truly love God if you do not love your neighbor. But to love your neighbor; to respect him or her, you must also love and respect yourself. No, I’m not suggesting leaping into the depths of narcissism, but as I’ve said in the past, depression robs us of the purpose, the meaning, the joy that God has created for all of our lives. It is the thief that takes from us who we really are. Depression is not a sin, but it can take you to places lower than any sin. When you’re sitting at the bottom of the abyss, buried up to your neck in darkness and held in place by the heaviness of your chains, it can be extremely difficult to imagine any other type of life. And yet God did not create you to live in darkness and to exist in the shadows. While there are circumstances that can be difficult or even impossible to overcome physically; slavery, imprisonment, chronic brutality by a spouse or parent, God has always intended more for us. Even when the physical or emotional torture and abuse has passed and we are free from those chains, often times, we continue to forge bonds of our own and then place ourselves in their power. Unfortunately, the darkness and chains that some people live in are invisible to the rest of us. All we see is the anger, the outbursts, the bullying, and the ugly way we are being treated by this person. We never see how terribly they are treating themselves. 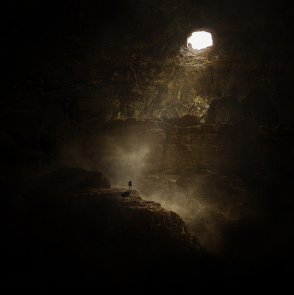 If only there were a way out of the abyss; a way to rise up and climb into the light. Higher consciousness is more than a state of mind. It is a way of eating, of sleeping, of loving, of speaking, of doing business—it is apparent in all your ways. I know the climb seems insurmountable. 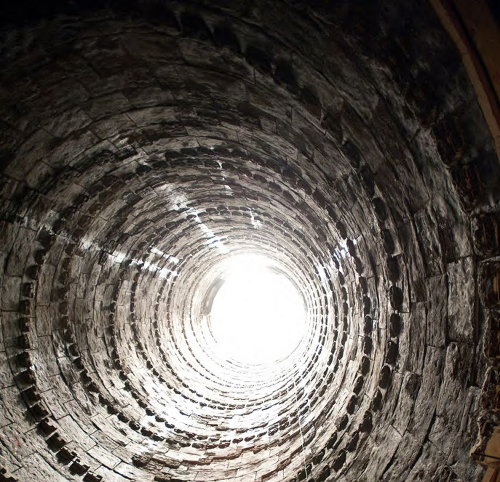 I know you don’t even want to admit you are at the bottom of your well. It’s never too late. Not as long as you don’t give up hope. Not as long as you can still look up and see the light. Look at the light. Begin your climb. Rise. Yeah. I saw the film for the first time over the weekend and, when the “concept” of this blog post came to mind, the image from the movie was a natural selection.